Last year and last minute I created quilled snowflake ornaments to sell on etsy and at Creativity (shop where I rent a space) so this year I thought I'd get a head start and I've actually started on snowflakes, or flake - just one so far but it's still a start. I have also decided these lovely snowflakes needed some sort of holder. I didn't want to copy off of others and I wanted to keep it cheap but cute, so after giving it some thought, I looked through my Cricut Tags, Bags, Boxes & More and they had the perfect item - matchbox. So I found some different seasonal papers and have been cutting out and preparing my matchboxes. I don't use my Cricut machine enough but when I do I'm so happy with it. 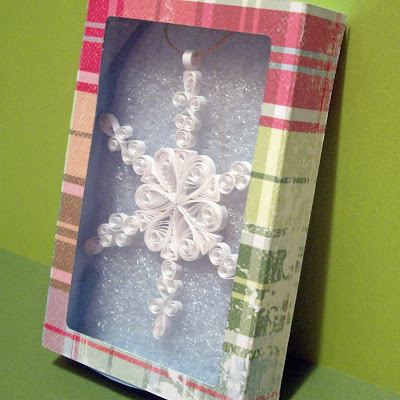 This is my Let it Snow snowflake shown in it's festive plaid matchbox - I have 3 different styles of snowflakes that are my original designs, I would like to be able to get all 3 done and in my shops for this Christmas, we'll see. Wouldn't they make the perfect gift? Yes they would, so I'm offering a deal - visit my shop on etsy and if you purchase a snowflake mention this blog post in notes to seller and I'll take $2 off the price - that'll make it $10 - awesome deal and who wouldn't love to receive this to hang on their tree or in a window. These take awhile to create so come on and place your order now. This offer expires October 1, 2009.